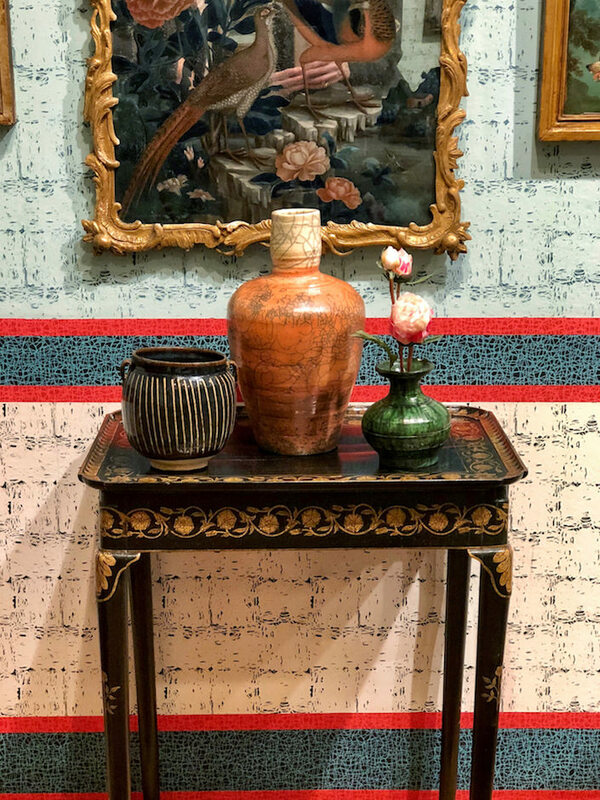 Two large cherry blossom filled 17th – 18th c. Asian storage jars flank the entry and a go-with-everything 19th c. Bakshaish carpet anchors the space. 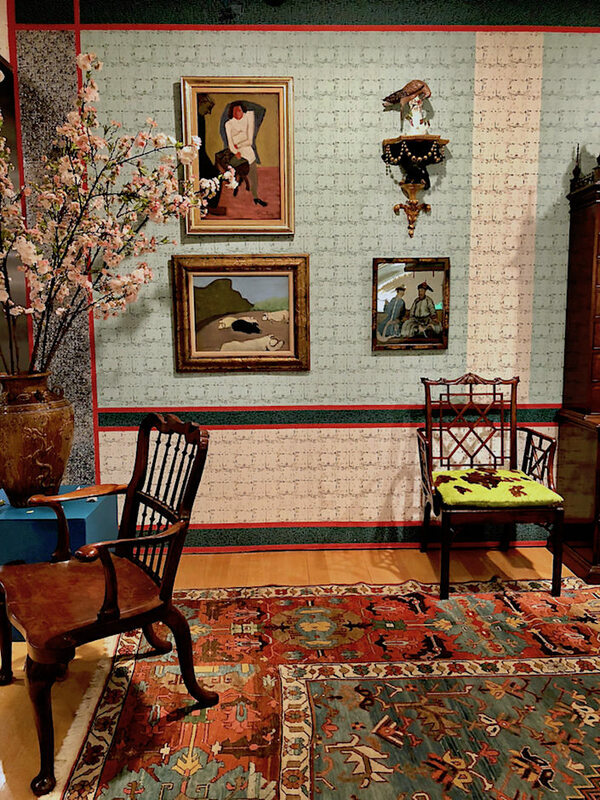 Below you can see the clever graphic wallpaper design along with two Milton Avery paintings hung alongside one of a pair of Chinese export reverse mirror paintings. Frank updated the handsome pair of George II armchairs (possibly by Chippendale) with modern cowhide cushions. The center of the gallery features a classic George III breakfast table accompanied by a set of four north Italian blue and polychrome-painted 18th c. chairs. I love the beautiful early 19th c. Vienna Porcelain ornithological plates Frank chose. 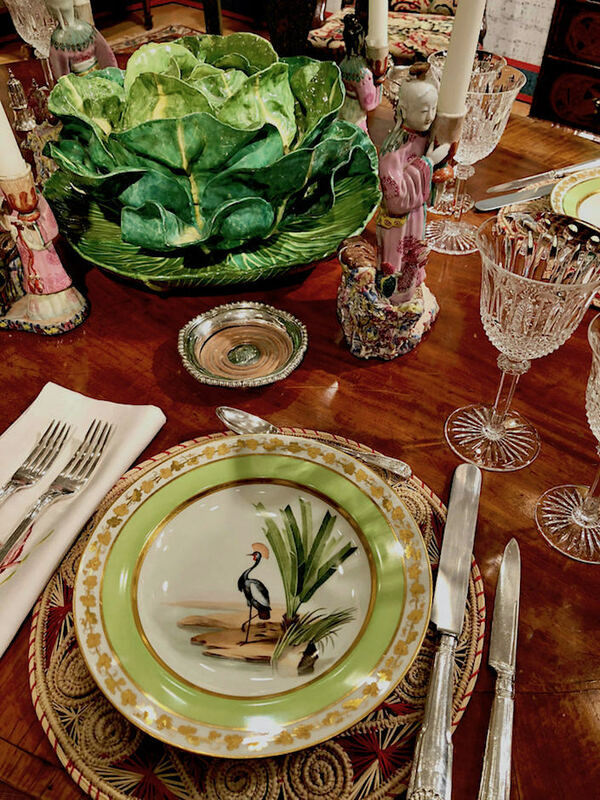 Mixed with Creel and Gow placemats (which I also own and shared here) and sparkling Saint-Louis crystal, he shows how you can give new life to antique pieces. 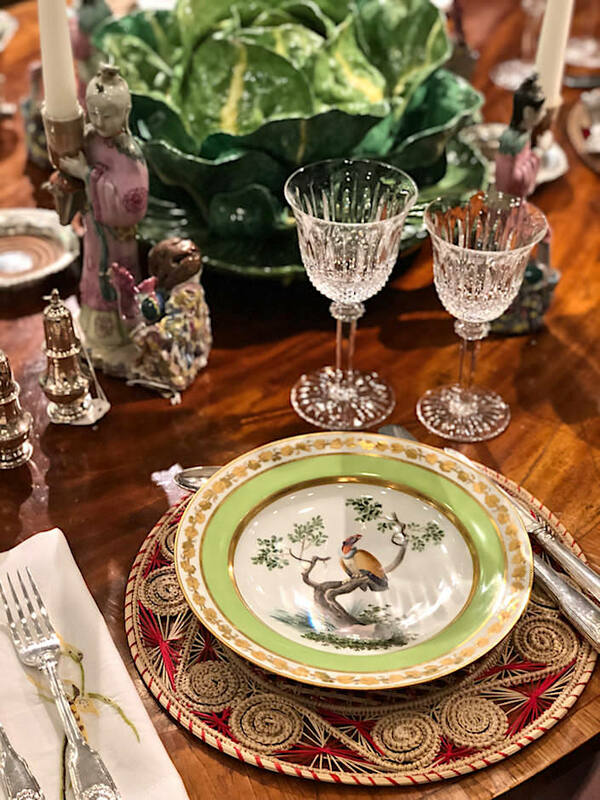 You can see that each exquisite handpainted bird vignette is different and coordinates beautifully with the spectacular large 18th c. Strasbourg faience cabbage tureen. 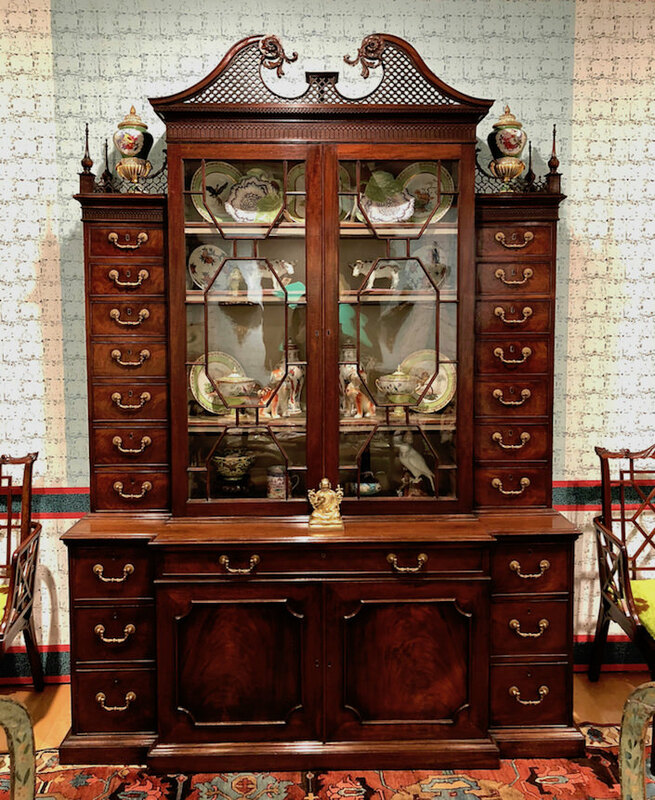 Emphasizing the dining area, a George III breakfront with marvelous detailing holds an assortment of porcelain. 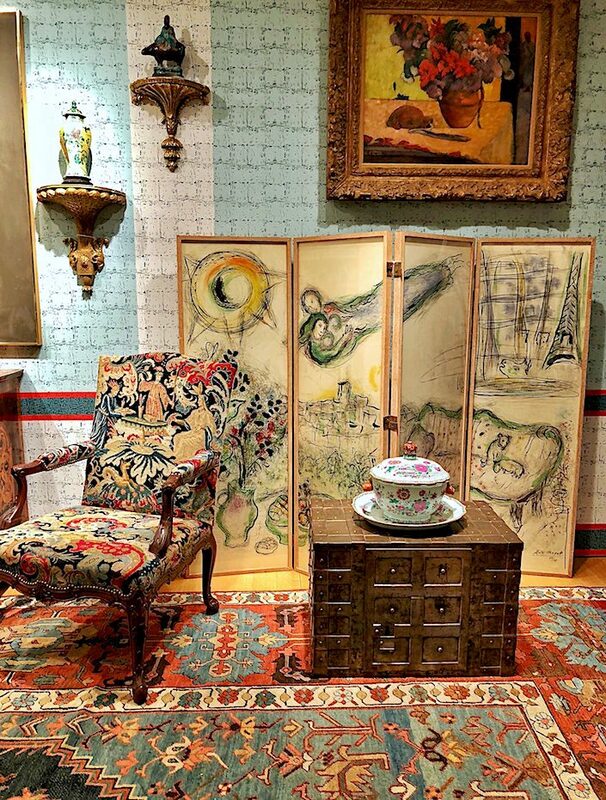 In fact this piece and the overall enlightened eclecticism of the room reminded me of Frank and Gene’s apartment – video visit coming later this year! A favorite vignette in the space deftly demonstrates the art of the mix. David and Peggy Rockefeller appreciated and collected art from around the world. 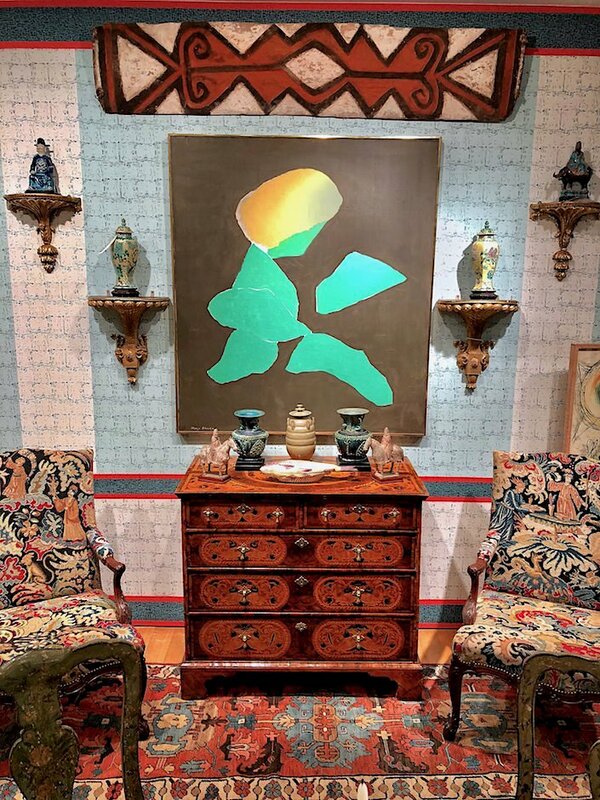 Here a fine William and Mary oyster-veneered chest of drawers sits below a Telofomin houseboard (a decorative tradition among these Papua, New Guinea people) and Japanese artist Kenzo Okada’s abstract expressionist “Night Sunflowers” flanked by a beautifully preserved pair of George II armchairs with 18th c. needlewoork. And to the right, a wonderful Chagall screen sits below Gaugin’s “Fleurs dans un Vase” that was hanging in the Christie’s boardroom for the lunch with Martha Stewart and Kevin Sharkey with an 18th c. Chinese export famille rose soup tureen on a German steel strong box from the same period – quite the mix! with Chinese and Japanese pottery sitting on a classic George II penwork side table. 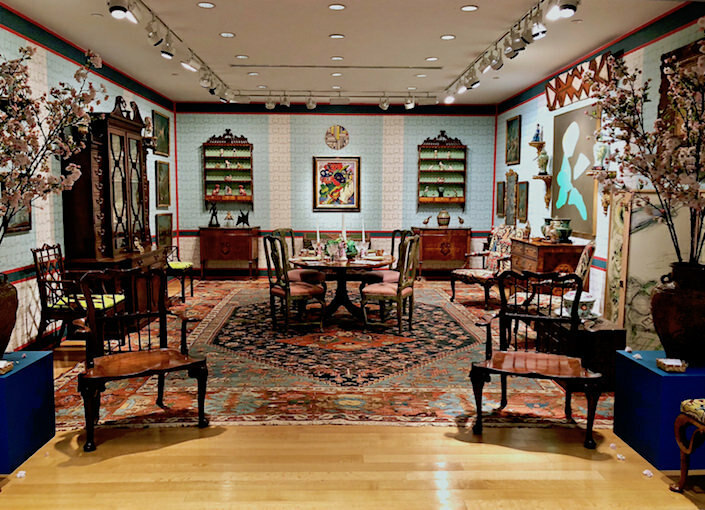 Frank’s design for the lobby gallery will remain open through March 23rd, concurrent with Christie’s expansive displays for their Asia Week NY auctions. This entry posted in art, art history, auctions, Christie's, design, furniture, interior design. 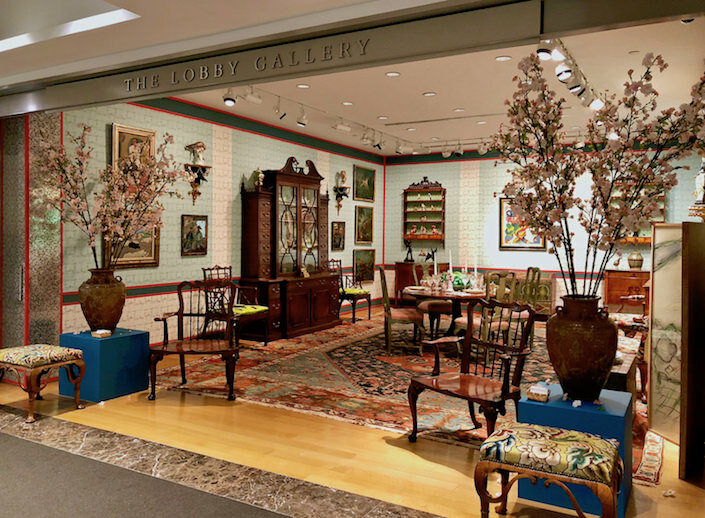 Entry Tags: auction, auction houses, auctions, Christie's, Frank de Biasi, interior designer, Peggy and David Rockefeller, rockefeller, Rockefeller auction Bookmark the permalink. 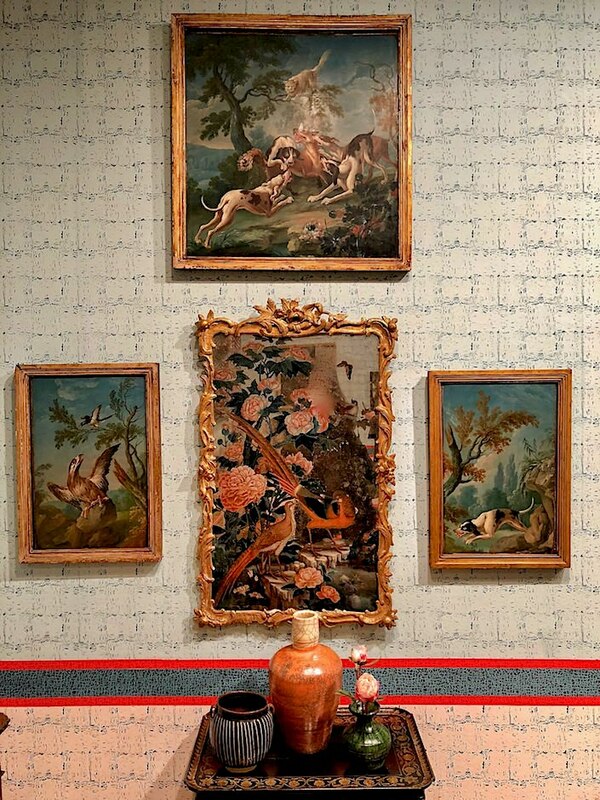 What a wonderful job Frank de Biasi did arranging those treasures! Anyone who thinks “brown furniture” is over is mistaken! Great opportunity to buy it now! I adore the painted chairs with the mahogany table! Exquisite! Lovely work. I wish more setting the table videos would magically appear on your youtube channel. Perhaps Frank and Gene would oblige? Wonderful post. So visually beautiful and textually informative. Mr. de Biasi did a magnificent job in honoring the collection. Thank you for all the work you do bringing us beautiful posts, videos, and the stories behind them. Thank you so much for this blog and your video on Facebook. I love how you write about the pieces, really highlighting the beauty of the fine antiques, the art and the porcelain. This place is incredible. It really is, as someone else said, a feist to the eyes! 80 queries in 0.699 seconds.